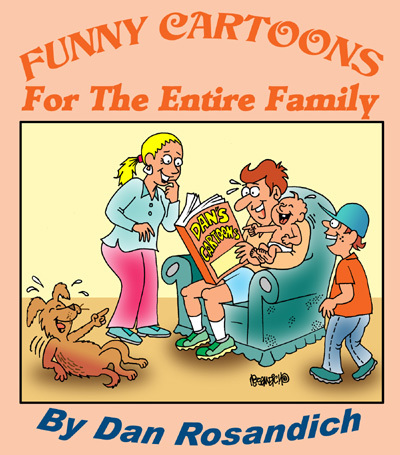 Medical cartoons available in my catalogs can be licensed in your next print project. Funny hospital cartoons will appeal to readers of your monthly newsletter. Funny doctor cartoons are ideal if you want to feature some light hearted humor at your next presentation. Cartoon medic panels could be used in a print advertising project if you seek medical cartoon images for any print projects promoting your hospital or medical group practice. Free medical cartoons are not available since I maintain my medical cartoon database as a commercial venture. A lot of medical cartoons for presentations free usage are a common request but I apologize for not allowing free medical cartoons to be used without permission. Please contact me with any specific questions about my medical doctor cartoon images and a fast response is guaranteed. I also offer funny health cartoons. Publications where my single panel cartoons have been published include Resident & Staff Physician, Michigan Medicine, The Internist, Resident & Staff Physician, International Medical News Group including a diverse variety of regional specialty medical publishers of magazines and newsletters. Ideally, cartoon humor that depicts doctors interacting with patients and vice versa, including nurses and hospital related cartoons could be applied in most any graphic format. A variety of doctor and patient cartoon images I make available here, can be colorized or the captions changed if you wish. Jst ask any questions if you have them and if we need to speak on the phone, supply a number where I can call you. Contact me about any image here. You can also get any cartoon re-captioned or re-drawn to your liking if it may work on a greeting card, calendar or special print project you are designing. You can reach me anytime via the form or email address on my contact page and a fast response is guaranteed.